A hole is a hole, I suppose except when its a tower guy wire anchor block. Then its something special. In this photo the concrete fill is almost to the top rebar. 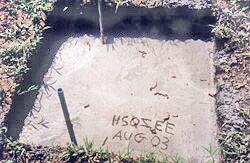 Concrete was eventually filled to within a few inches of ground level. The hole is approximate 1.2 meters cubed. 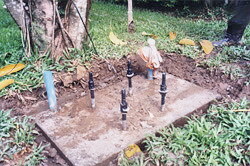 The anchor rod is 1.6 meters long, tied to the bottom of one side and protruded at the top on the opposite side, the angle is set to be the same as the angle of the guy wires. The rod is approximate 1 inch thick, with a dropped forged loop at one end, and a 90 degree bend at the another end to tie it into the concrete. It was additionally fixed to the rebar. 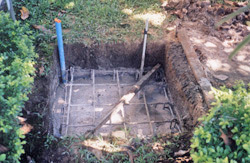 All anchor point, and tower base blocks, have a one and a half inch plastic water pipe inserted down one side of the foundation and a few feet below for an earth rod to be driven through. The tower foundation, was not dug as deep, or as large as the anchor blocks. But did require special attention due to the alignment of the base plate. The threads on all the four J bolts were long but the bolts themselves were shorter than I would have liked. I would have preferred them to be at least three quarter meter, and not half a meter long. It became a juggle leaving several inches above ground, and obtaining the deepest point, for attachment to the rebar for anchoring. I assume the manufactures considered that this was a thrusts or compression block and not a lateral or uplifting block. As the tower had a pier pin system, free to rotate, I went ahead without any modification to the bolts. 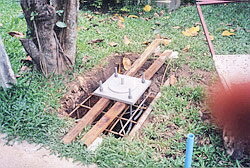 The supporting timber is 4 by 2 inches and concrete was poured to the bottom of the timber. This is the finished and set tower block with bolts protruding. The bolts were protected with insulation tape to prevent the threads becoming fowled. Two blue water pipes are visible, center left, and top right. It is interesting to note that since completion, and two years on, that when tested the pipes approximately 2 meters deep, are always half full of ground water.